Located in Gettysburg, Pennsylvania within the grounds of Gettysburg National Military Park, the Gettysburg Museum and Visitor Center provides exhibits and information about the 1863 Battle of Gettysburg, a seminal battle of the American Civil War credited as the turning point toward the Union Army’s eventual victory. Fought from July 1 through 3, 1863 near the city of Gettysburg, Pennsylvania, the Battle of Gettysburg is considered the most notable turning point in the Union Army’s campaign against the Confederacy during the American Civil War. The three-day campaign saw the defeat of the Army of Northern Virginia, under the command of General Robert E. Lee, to Major General George Meade’s Army of the Potomac. As the bloodiest conflict of the war and to date on American soil, the battle resulted in more than 50,000 dead, wounded, and missing soldiers between the two armies and heavily influenced the ideology laid out in President Abraham Lincoln’s famed Gettysburg Address, delivered on November 19 of that year. Land associated with the Battle of Gettysburg was acquired in 1864 by the Gettysburg Battlefield Memorial Association for the purposes of creating a memorial to the conflict’s fallen soldiers. The following year, the land was formally dedicated as a national park memorializing the seminal battle. In 1933, care of the military park was transferred to the National Park Service, and throughout the 20th century, several additional tracts of land were added to the facility. The history of displaying artifacts related to the Battle of Gettysburg at the park dates back to 1881, with a display of items from the collection of J. Albertus Danner, and in 1921, a formal museum was opened on the park’s grounds. Following the battle’s centennial memorial, the National Park Service acquired collections from the Round Top Museum, operated from 1888 through 1964, and integrated them into the existing Gettysburg National Museum collection. In 1974, the museum became the park’s official visitor center, and in 2008, the facility was completely rebuilt and renovated. Today, the Gettysburg Museum and Visitor Center serves as the official entrance point for the 3,965-acre Gettysburg National Military Park facility, offering a number of park resources alongside 22,000 square feet of exhibit space dedicated to the history of the Battle of Gettysburg and the American Civil War. The museum is owned and operated by the Gettysburg Foundation and is open seven days a week, with the exception of major national holidays. As an official park visitor center, the museum offers a variety of park information, including maps, landmark guides, and information on facility hours and guidelines. 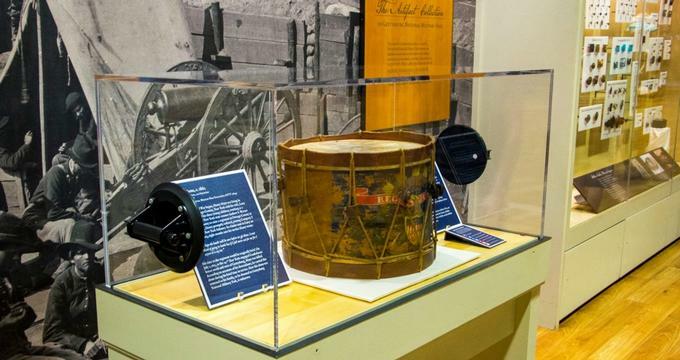 Within the museum, several interactive exhibit galleries showcase artifacts from the Battle of Gettysburg, including firearms and cannons used by the Union and Confederate Armies and preserved uniforms of troops who fought in the conflict. Exhibits chronicle the battle’s complete history, from the campaigns leading up to the conflict through its impact on Lincoln’s Gettysburg Address and the outcome of the war. The 1884 Gettysburg Cyclorama, a cylindrical panoramic painting by French artist Paul Philippoteaux, is also on display in a special exhibit room. One of two surviving copies of the painting, the cyclorama depicts the battle’s seminal Pickett’s Charge attack on July 3 and is one of the few surviving cyclorama-style paintings known to exist in the United States. Visitors may also view the 20-minute orientation film “A New Birth of Freedom,” narrated by actor Morgan Freeman, which highlights the historical impact of the battle. A visitor center bookstore, operated by Event Network, offers titles and gifts related to the American Civil War. The facility also contains an independent research computer resource room, which offers additional volumes and information related to the war and to soldiers within the Union and Confederate Armies. A small restaurant, the Refreshment Saloon, also offers light fare and beverages in a recreated soldier’s rest area environment. The museum and visitor center serves as the trailhead for a number of battlefield tours, led by the park’s licensed Battlefield Guides. Reservations for battlefield tours must be made directly through the visitor center, either in person or in advance by calling the facility. Shuttle bus tours also embark from the museum for exploration of the nearby Eisenhower National Historic Site, which preserves the former home of United States President Dwight D. Eisenhower. A variety of ranger-led public programming, providing historical information and park exploration opportunities, is also offered at the site daily throughout the summer months and on weekends during the park’s off-season. Special accommodations for museum and park programming may be made through the center for visitors with disabilities, including captioning and audio assistance for museum exhibits and presentations.